1. 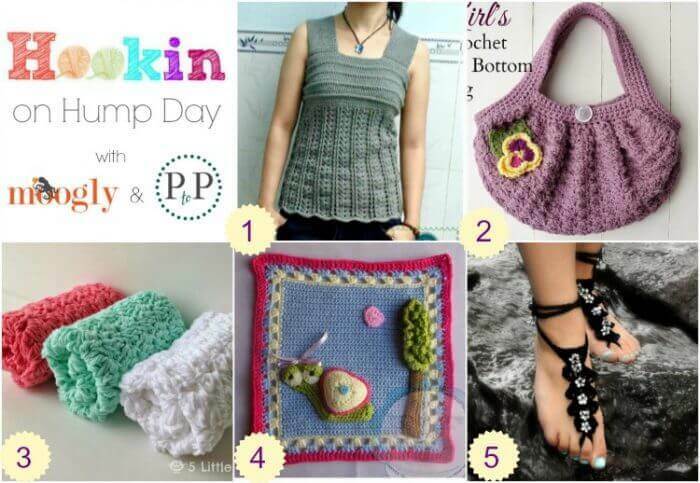 MOST CLICKED LINK: Crochet Wide Strap Tank by Maz Kwok’s Designs – a flattering, casual design and free on her blog! 2. Crochet Fat Bottom Bag by Over the Apple Tree – Adorable bag with a Spring feel. Free tutorial with link to FREE charted pattern! 3. Sedge Stitch Dishcloths by 5 Little Monsters – Quick and easy dishcloth that has a little bit of texture … FREE pattern! 4. Snail Square by Creative Crochet Workshop – An adorable afghan in her whimsical “My Garden Bug Blanket” series … FREE pattern too! 5. Barefoot Sandals by the Hooked Haberdasher – It’s the season for barefoot’n … a fun and FREE crochet pattern to make, wear, or gift! awesome party! i so love all the inspiration and support! Thanks for hosting us!